This chicken with mustard recipe from David Lebovitz, made with chicken, mustard, thyme, and stock, is a classic French dish. Many years ago, when prices were ridiculously low, I bought an enormous copper pan at E. Dehillerin, the famed cookware shop in Les Halles. This one-pot chicken with mustard recipe is a perfect fit for your largest, most extravagant pot. The thing about chicken—or, as the French say, “poulet”—is that it’s only boring if you allow it to be. And far be it from the French to let anything be less than shamelessly fashionable. And so with this single recipe for poulet à la moutarde from Parisian David Lebovitz, you can assure anyone who asks “Parlez-vous poulet?” that yes, in fact, you do. Quite fluently. 1. Mix 1/2 cup Dijon mustard in a bowl with the paprika, a few generous grinds of the peppermill, and the salt, if using. Toss the chicken pieces in the mustard mixture, lifting the chicken skin and rubbing some of the mustard mixture beneath. Set aside while you tend to the bacon and onion. 3. Add the onion to the bacon drippings in the skillet and cook for about 5 minutes, until soft and translucent. Stir in the thyme and let cook for another few minutes, then scrape the cooked onion onto the bacon. 4. Add a little olive oil to the skillet, if necessary, and add the chicken pieces to the skillet in a single layer over medium-high heat. (If the pieces don’t all fit, cook them in 2 batches.) Brown them well on one side, then flip them over and brown them on the other side. It’s important to get the chicken nicely colored, as this coloring—as well as the darkened bits on the bottom of the skillet, called fond—will give the finished sauce its delicious flavor. Place the chicken pieces on the onions and bacon. Add the wine to the hot skillet, scraping the darkened bits off the bottom with a sturdy flat utensil. Return the chicken pieces to the skillet along with the bacon and onions. Cover and cook the chicken over low to medium heat, turning the pieces in the sauce a few times, until the chicken is cooked through, 15 to 25 minutes. Check for doneness by sticking a knife into the meat next to the thigh bone; if the meat is red, continue cooking for a few more minutes. 5. Remove the skillet from the heat. Transfer the chicken to a platter and stir the remaining 3 tablespoons Dijon mustard, the mustard seeds or grainy mustard, and the crème fraîche or heavy cream into the pan drippings. If the sauce has reduced and is quite thick, you can thin it with a little warm water, adding a teaspoon or so at a time. Pour the sauce over the chicken, sprinkle chopped parsley over the top, and serve. Chicken with Mustard | Poulet à la Moutarde Recipe © 2014 David Lebovitz. Photo © 2014 Ed Anderson. All rights reserved. All recipes and photos used with permission of the publisher. I decided to make this chicken with mustard recipe because my wonderful husband loves mustard chicken. You'll wonder throughout the cooking process for this braised chicken dish if it's going to turn out good and if all the preparation is worth it, and gosh darn it, it is! There are a lot of steps to this delicious dish. Make it easy on yourself and pre-prep every ingredient. In French it's called mise en place, meaning "put in place," and that's what you do—all the ingredients are measured, chopped, etc. Then all you have to do is line everything up next to your stovetop and voila! 1, 2, 3, 4…you know what comes next, and you won't be scrambling. My husband will only eat white meat, so I had to appease him. I used a whole chicken—2 breasts cut in half, 2 legs, and 2 thighs—and it worked out perfectly. So go ahead and use white meat if you want. A few tips on this dish: It's very important to get the pan very hot before adding the bacon. You can tell when the pan is hot by adding a little drop of water in the pan. If it turns into a mercury-like ball, the pan is good and hot and you can add the diced bacon. It won't stick to the pan when the pan is hot enough; it just glides over the pan and is easy to sauté. Lower the heat and continue to sauté the chicken, stirring constantly. The recipe calls for lightly browning the bacon until it's cooked through. It seems impossible to cook the bacon through and only lightly brown it, but follow the instructions and lightly brown without cooking it through. The melted bacon fat will be delicious and sans burned bits, and the bacon will continue to cook and crisp out of the pan as well as when you add it when braising the chicken. It took about 2 1/2 minutes on medium to lightly brown the bacon. Add the onions and cook until "translucent." Again, don't turn up the heat too much or you'll get burned onion, and that will result in the final taste of the sauce being bitter. Now it's time to add the chicken: You will need to add a TB or so of olive oil before adding the chicken, because when you spoon out the onions, they will have absorbed all the fat, and the pan will be dry. The chicken will need that oil to brown well. The trick here is to add half the chicken pieces, not all; do not crowd the pan or the chicken pieces will boil as they release liquid and not brown. It took about 6 minutes on the first side on medium heat (skin-side down first, always), then about 4-5 minutes on the second side. The next batch cooks a lot faster, as the brown bits that form on the bottom of the pan brown the chicken much more quickly. For the second batch, it took about 4 minutes on the first side, and 3-4 minutes on the second side. Now the magic happens. The chicken doesn't look so great: not beautiful, not cooked through, but once you add the wine and deglaze the pan, add the chicken pieces (all of them now fit in the pan), cover it, and turn every 3 minutes or so. They will take on a beautiful, bronze caramelized exterior, and the fragrance will make you swoon. The recipe says it should take about 15 minutes. I found that it only took about 6 or 7 minutes until the chicken pieces were all cooked through. Add the extra mustard, crème fraîche, and yellow mustard seeds, bathe the chicken in this delicious sauce, turning over and over. And oh my goodness, you have just created a dinner to remember. Sprinkle the parsley on top, as it adds a touch of elegance. When plating, it can be messy. Just place the chicken pieces on your warmed plate, spoon sauce on top, sprinkle parsley, and wipe the plate with a damp towel to clean up any messy sauce spills. It made for a beautiful, elegant, and romantic meal, and my husband loved it. I’ve made this chicken with mustard recipe twice, and it's a winning dish. The chicken turns out super moist, and the sauce has layers of flavor from the mustard, bacon, onion, and the crème fraîche. It’s exquisite. The first time I prepared this, my chicken pieces were a little bigger, but I was still able to fit them all into a very large skillet without overcrowding. My only nitpicking about this recipe is the need to keep moving things out of the skillet into bowls and then putting them right back in, but I don’t think there’s a better way. A lazier approach, tempting though it might be, would produce a lesser result. I’d say this serves 4, though perhaps it would serve 6 people at a French table. It would also depend on the size of the chicken pieces and what else was served with it. I served it with a baby spinach and arugula salad and buttered boiled new potatoes with dill. It's fantastic observing some basic science in everyday cooking. Maybe it's odd to start my review of what is basically a rustic French chicken dish like that, but that's the first thing I noticed when I tasted it. Ok, to get it out of the way first, this chicken with mustard recipe got a big thumbs up from everyone who tasted it. It's delicious, rich, and full of robust flavors, and to top it off, it's simple to make with few on-hand ingredients. I'll be making this many times come fall this year. Back to that science comment. Dijon mustard is pretty hot, and I had read that mustard's heat dissipates when cooked, but I have never tested that before. In this recipe, the chicken is marinated in a LOT of hot mustard, and I was worried that it might end up too harsh for the kids and my wife to enjoy. Well, after cooking the chicken, the mustard's heat was gone. The meat tasted mellow and perfectly balanced but not spicy at all. I appreciate the author's instruction to add a few tablespoons mustard off the heat at the end because that brings a little of that sharpness back. Since the sauce was very hot, though, even that mustard's edge is tamed and mellowed, resulting in a perfect balance. It's also very interesting how the chicken browns with no problem even though it is pretty "wet" with all the mustard. This really is lovely. It's pretty much a fricassée that Julia Child would love. I used a Sauvignon Blanc with a good bit of acidity. I did need some additional olive oil in the pan to brown the chicken since I only had a little of the bacon fat and most of it got scraped out with the onions. I needed to brown the 8 pieces of chicken (used all thighs) in 3 batches in my oval Le Creuset Dutch oven. Finally, a BIG thumbs up for weight measures here—in grams, no less. I weighed the mustard (what a pain that is to measure with a cup and then have to clean it afterwards) and the bacon before dicing. I'll need to add this book to my collection. This chicken with mustard recipe is so good it's almost hard to believe! I made it for a weeknight supper, and you would've thought that we were at a French bistro. The chicken was moist, and the sauce was rich and really flavorful. Most importantly, my kids really liked it, and my husband asked me to promise that I would make it again. One modification I made that I can't recommend enough is to serve it with rice instead of pasta. This sauce is so good that you will be looking for another vehicle to serve it up with when the chicken is gone. With minimal chopping and no marinating, there isn't much prep time for this dish. Hands-on time was approximately 25 minutes, and start-to-table time was 45 minutes, so it works for a weeknight meal. I liked that the chicken cooked in the sauce during the final 15 minutes so I could work on the sides and start my cleanup. I used fairly lean bacon and did not pour off any of the bacon fat. I added a tablespoon olive oil to my pan before cooking the chicken to make sure there was enough fat in the pan to brown the chicken. I also used salt sparingly since the mustard adds enough zip, in my opinion. I used a Chardonnay for the white wine, but don't cook it for too long before adding the chicken, or too much wine may be cooked off for the chicken to simmer in. The chicken was done in 15 minutes, but I'd watch carefully to make sure it doesn't dry out. I did have to add a touch of warm water to thin out the sauce, but otherwise the sauce virtually made itself. I consider myself to be relatively proficient in the kitchen. When it comes to baking and even curing and smoking my own meats, I am nearly fearless. The one fear I have always had, though, is French cuisine. This chicken with mustard recipe has removed a huge barrier for me. This dish is so good, I made it 2 separate times in the last week. The first time I prepared it, I used my trusty Le Creuset Dutch oven. The chicken didn't brown as nicely as I'd hoped, but the flavor was divine. The second time I made it, I used my large cast-iron skillet. This is the only way I will do this dish in the future. Start by cooking the bacon for 5 to 8 minutes, as the small pieces will cook quickly. The onion and thyme should cook in just a few minutes as well. I suggest not draining the bacon fat, as there really isn't a lot there. You may even need to add a bit of oil to make certain that there is enough to brown the chicken. The first time I made this, I tried to brown the meaty side of the thighs first and, some of the precious skin stuck to the Dutch oven. To avoid this, make certain to heat the oil so when you drop a seed or crumb in, it sizzles a bit. Next put the thighs in, bone-side down, and, brown for about 5 minutes. Turn the thighs and brown the side with the meat. This may take 15 to 20 minutes, depending upon how many pieces you are making. I used a Sauvignon Blanc. The general rule of thumb when cooking with wine is if you wouldn't drink it, you shouldn't cook with it. I chose to use a thermometer, instead of a knife, to be certain the chicken was done. When the thermometer read 165ºF, which took about 20 minutes, I removed the chicken. I added the mustard seeds and 3 tablespoons heavy cream. We really loved this dish, and I enjoyed making it. If French cooking is intimidating to you, as it has always been to me, this Poulet à la Moutarde is the perfect medicine. Please let Julia know I'm leaving the sidelines! This chicken with mustard recipe was a little time-consuming but worth it. I used smoked paprika, 8 chicken thighs, Millbrook Tocai Friulano for the white wine, about 1 cup onion, whole mustard seeds, and crème frâiche. I finished with about 20 minutes on low, covered. It was delicious that night with pasta and the next day as reheated leftovers with mashed potatoes. The recipe had me at the title Poulet à la Moutarde--chicken with mustard. Browned chicken with Dijon mustard and white wine—what's not to love? It sounded like the perfect comforting home-style French dish...and it was. The recipe is straightforward and easy to put together. Although there are 4 main steps, the recipe allows for the prep of ingredients in stages. For example, I diced the onion while the bacon was browning, and I tossed the chicken with the mustard mixture while the onions were cooking. It took me about an hour from start to finish. If you have a large and deep Dutch oven or skillet with a lid, this will be helpful. I have a classic round 6-quart Dutch oven, and I browned my chicken in 2 stages to ensure browning and no overcrowding. I would make this recipe again, as my family really enjoyed the flavors. I served the chicken with roasted potatoes, and the potatoes soaked up all of the lovely sauce. Serving size is more like 4 people—this is too good to eat just one piece. I did not use salt, as the Dijon mustard I was using already had plenty of salt in it. I used a Gruner Veltliner wine from Hungary. This chicken with mustard recipe is a flavorful meal with an incredible sauce that comes together in no time. I used Oyster Bay Sauvignon Blanc for the wine. My family is not fond of meat on bones, or skin, so I substituted skinless and boneless chicken breasts (4) and thighs (4), and I don't feel it was missing anything. I did have to add a bit of EVOO before I began browning the chicken. The browning process took me 22 minutes. I had to do it in two batches in my Le Creuset Dutch oven. The 15 minutes braising time was sufficient for boneless meat. I imagine it would have taken longer for bone-in chicken. My sauce didn't need any thinning in the end. It was the perfect consistency. I finished it off with 3 tablespoons heavy cream, and it was a rather impressive sauce. The only thing I would adjust is not using any additional salt. The bacon and the mustard added plenty, at least for me and my family. I served this with roasted sweet potatoes and sautéed kale, and it was delicious. However, now that I know what an impressive sauce this makes, the next time I make it I will be serving it with a simple pasta, as suggested by the author. This chicken with mustard recipe was a comforting and aromatic dish for 4 people. I used smoked paprika, and it brought out the smokiness of the bacon in the dish. I used Chardonnay as the white wine. Definitely keep the bacon drippings! I used them to season fresh green beans. I did add 2 tablespoons water in the final step to loosen the sauce some. We loved the spicy kick the whole mustard seeds gave the dish. This dish was perfect for company, and we could just sit and wait for the pasta to cook. Fragrant and mustardy—delicious dish! It's highly likely that you have all the ingredients for this chicken with mustard recipe on hand, and if you do, I recommend that you make this recipe ASAP. You won't be disappointed! It was so good. I have a thing for bacon and am also quite fond of Dijon mustard, so I knew that I would enjoy this dish. The preparation is pretty straightforward. I opted to use smoked paprika just because I had recently purchased a nice tin of it. I used the tablespoon bacon fat to cook the onions and thyme and didn't discard the extra bacon fat. In fact, I ended up adding a little bit more bacon fat, rather than olive oil, before cooking the chicken. It took about 10 to 15 minutes or so to brown all the chicken, but my pan has a lot of surface area, so it might take a bit longer in a smaller pan. Because of the mustard, there are a lot of bits to be scraped up once you add the wine. The mustard kind of sticks to the pan and caramelizes, so be prepared to scrape. I used a pinot grigio to deglaze the pan. The timing for cooking the chicken is correct. This is such a good recipe...definitely a keeper! This chicken with mustard recipe was a quick, fun dish to make, and everybody liked it. The recipe is straightforward and mostly accurate. I found it very difficult to brown the chicken. The skin was pretty wet with all the mustard, so the pieces wouldn't brown properly. There were enough bits and pieces, though, that stuck to the pan and browned well. I used a cast-iron skillet and fried the chicken in 2 batches. After frying the bacon, onions, and chicken (which took me about 30 minutes total and could easily be done in advance ), the dish came together quickly and simply. Just add wine (I had a bottle of cheap rosé open and used that) and cook the chicken through. Add some cream and mustard, adjust the seasonings, and you're done. This recipe is a keeper; we'll definitely make it again. This chicken with mustard recipe is so much greater than the sum of its parts! This simple, homey dish is fancy enough for company, and you can whip it up in an hour or so and only dirty one pan. I browned 3 strips thick-cut bacon that I'd diced, and I used the pot lid to hold the browned bits of bacon then the onion and thyme that were sautéed in the bacon drippings. I used fresh thyme--about 5 sprigs—and the aroma of onions and thyme cooking in rendered bacon fat was intoxicating! I really don't think dried thyme would work as well. I didn't use any extra oil to brown the chicken, as the thighs have plenty of fat on them. It took about 20 minutes to brown my chicken pieces in batches. The browned pieces went into the pot lid with the bacon and onions. I added the wine, a Portuguese vinho verde, to the pan, and then added the chicken, bacon, and onions back in and let the mixture simmer. It needed 20 to 25 minutes to cook the bone-in thigh meat. I then removed the chicken from the pan and stirred the mustard, mustard seeds, and some strained goat milk yogurt into the pan juices. I placed the chicken in the thick sauce and served it over pasta. It was lick-the-plate delicious. I haven't been to France in a decade, but that is where I fell in love with Dijon mustard. I remember buying a sandwich from a street vendor and slathering mustard on the baguette without a second thought. A few blocks later, I sat down to eat and was blown away by the amount of flavor in my sandwich. There was zing, there was spice, and there was tons and tons of flavor. I couldn't believe I'd been denied French mustard my entire life. I bought a huge crock of French mustard, and that's when my obsession with the condiment began. The mustard I use today is the same mustard I bought in France. It's much more widely available now in the United States, though I wouldn't say it's inexpensive or that it can be found at any grocery. However, I think the quality of your finished chicken dish depends largely on a great mustard. It'll be good with anything, but it will be great with great mustard. There are only two of us in the house, so I halved the recipe. The whole thing took me about an hour to make, and I was preparing 3 to 4 other dishes at the time. I started by tossing the chicken in the generous amount of mustard mixture and stuffing it under the skin as much as possible. Then I cooked the bacon in my Dutch oven for about 5 minutes, until it was brown. When that was done, I set it aside and saved the bacon drippings in my "bacon fat jar" which I keep near at all times (as any good Southerner should.) Then I added the onions with fresh thyme and when they were done, I tossed them in the bowl with the bacon. A little oil was needed before adding the chicken pieces. I added them skin side down to get the skin as crisp as possible. When they were browned, I added them to the bowl with the bacon and onions. A dry pinot grigio deglazed the pan nicely and added good flavor to the finished dish. Everything cooked together until the chicken was done, and then I stirred in the latter Dijon mixture and a couple tablespoons water before serving. We loved the chicken and dunked our sides in the extra sauce, of which there was plenty. This recipe will definitely be in the rotation from now on. Wow! These flavors are fantastic. I found it helpful to prep everything ahead of time so that all the ingredients were ready to go as I needed them. I did pour off some of the extra fat into the jar of bacon grease I keep in the refrigerator. I used 8 chicken thighs instead of legs and thighs. (We just really like thighs.) I used a Sauvignon Blanc for the white wine. I used a very nice mustard made by one of our favorite wineries. And I added all 3 tablespoons homemade crème frâiche to the sauce. This was fabulous served alongside—and over—buttermilk Yukon Gold mashed potatoes. I am so looking forward to leftovers. Here's a chicken with mustard sauce that really delivers a robust, mustard flavor. Combine that with the smokiness of the bacon, the tang of the wine, and the smooth richness of the crème fraîche, and you have a dish that's absolutely delicious while being easy enough for a weeknight. The recipe works beautifully as written. There's nothing not to love about this one! The cooking time for the chicken in the wine was accurate. I did need to add a small amount of oil to the pan after sautéing the onions, as well as a small amount of water to the sauce to keep it from over-thickening. I used dry riesling for the wine. That huge copper pan you bought in Paris years ago reminds me of the very large copper stockpot I bought at Bloomingdales maybe 30 ago. It was $100, and at the time I felt guilty as could be because that seemed an unconscionable amount of money for a pot. They’re now selling for almost $900. And of course I’m still using mine and love it. Sometimes it pays to splurge. Indeed, Jean. Sometimes it certainly pays to indulge, especially in terms of things that bring us into the kitchen. Thank you so much for this. I can’t wait to try it. I especially appreciate all the reviews of the recipe, that will help a lot. I wanted to post here that David Lebovitz will be at The Brooklyn Kitchen for a book party, this Friday, October 10th. Sadly, I live in Ohio and won’t be able to make it, but they’ll also ship signed books. The Brooklyn Kitchen, 100 Frost Street, Brooklyn, New York (718) 389-2982. I’ve checked out this book pretty thoroughly, and I cannot wait to get my own copy. It’s fabulous, and I think it will be as much fun to cook from as it was to read. I hope the event is a huge success! Made this one night last week. I started it and my husband and 20-year-old son finished it beginning at about step 4 because I needed to get a run in before dark. (They had also helped with the prep work.) We followed the directions as written, except for two minor changes—no mustard seeds (we simply forgot to put them in) and we used all thighs (as that’s what we prefer). The sauce was rich and creamy and with those bits of onion and bacon, yum. The skin did stick a bit, and pulled off some of the thighs, but aside from that, it was perfect. I plan to make it again in the next few days for a friend who could use a glorious comfort food meal like this. Made this tonight, it was AMAZING. I was nervous, it’s a LOT of mustard, yet it doesn’t taste mustardy at all. The depth of flavor and the smoothness of the sauce was just incredible. I will be making this again and again. Sadly, we did not have enough chicken. I used a whole chicken cut up, but it was on the small side and next time I will definitely use meatier pieces. We were all sad to see the deliciousness end. I served it with a fruited brown and wild rice medley and a fall salad with apples, toasted pecans, goat cheese and a maple-mustard vinaigrette. Next time I’d be tempted to serve it with duck-fat roasted potatoes. I will definitely be making this again and again for a family dinner, yet it will also be in my repertoire for company dinners. Thank you so much for calling attention to such a fabulous dish. My wife has made this twice now and it is really delicious. The first time was with roasted potatoes and tonight was with mushroom risotto. After a long day at work I came home and was greeted by the luscious fragrance of this dish wafting through the air. I want to personally thank Mr. Leite for posting this recipe. I approve! Dan E, please, call me David. And you are more than welcome. It’s a favorite of mine and The One. We’ve made it several times, and it’s a killer. This is awesome recipe! Those who did not try it YOU HAVE TO TRY THIS MUSTARD CHICKEN! Heh. We feel exactly the same, David. Compelled to shout it from the rooftops! Glad you like it. Can you stop at step 4, refrigerate, then reheat and add the cream to finish ? Susan, that seems a perfectly reasonable (and helpful) make-ahead tip. Just be certain the chicken is cooked all the way through prior to remove it from the heat and then let it cool completely prior to covering and refrigerating it. If there’s any fat on the surface of the juices the next day, just skim it prior to turning everything into a saucepan and gently warming it. Renee, Thanks so much for your reply. I’m making it tomorrow and am so happy to know I can do it ahead of time. One question though…I have read that letting it cool at room temperature can create bacteria and to prevent that it should be refrigerated as soon as possible. What is the safest way to cool it? There are so many different opinions on this that I’m confused. susan, you’re right, there are a lot of different opinions on this particular aspect of food safety. I suggested letting it cool to room temperature to avoid what seems to be instinct for many people, and that’s immediately covering hot food after removing it from the stovetop or oven and then immediately putting it in the fridge. This creates two dangerous situations. First, the covered dish containing the food (in this instance, chicken) offers no escape for the hot air and, as such, the chicken is kept quite warm for quite some time. This puts it in the danger zone of bacteria-breeding temperatures. According to some food scientists, it keeps it in that danger zone even longer than if the dish had been cooled to room temperature on the counter. The second danger is that putting a hot dish in the fridge can raise the temperature of the fridge above the recommended 40°F which can endanger other foods in your fridge. Another option is to let the chicken cool for several minutes at room temperature to let a considerable amount of the heat dissipate and then stash it in the fridge with the lid to the container slightly ajar for the first hour or so. AFter the chicken has cooled, you can secure the lid on the container. Thanks, Renee, It is really hard to know what’s safe. I think I’ll remove the chicken from the Le Creuset to speed the cooling, and then put the chicken and sauce in the fridge in separate containers this morning. To reheat for tonight…and I hope I’m not going to overcook it this way…I’ll put them together again in the Le Creuset and into the oven at 350°F. When the chicken is back to 165 degrees I’ll stir in the cream and mustard and put it back to simmer on top of the stove. Is 350 too hot for reheating? Should I take it out of the fridge beforehand to let it warm up a bit before putting it in the oven straight from the fridge? I know this is a lot to answer, and I’ve cooked a lot, but there seems to be more talk of salmonella these days…something I never worried about before. I love your website and am so happy to be able to get a response so quickly. Susan, I think 350 is fine although you’re going to want to cover the pot to avoid the chicken drying out. I would take the chicken straight from the fridge into the oven because leaving it at room temperature, even if the chicken was previously chilled, presents a food safety hazard. Also, always be certain to buy chicken from sources you trust and if it smells off when you open the package, slide it into a resealable plastic bag and take it and your receipt back to the store and request a refund. I do this anytime the chicken is noticeably old. It’s just not worth it. Have a lovely time tonight, Susan. Thanks so much for your advice. I’m very happy I found this site. It’s going to be a favorite. You’re very welcome, susan. That’s incredibly lovely to hear. Thank you for taking the time to let us know. One of my all-time favorite chicken dishes is a mustard chicken from 60-minute Gourmet, so I gravitate to any chicken dish that also has bacon, wine, and onions. Making this tonight with a whole Bell & Evans chicken that I broke down into 10 pieces and have sitting in the fridge in its mustard coating. Used up the last of my white wine last week, so I’ll use vermouth. And will need to sub sour cream for the creme fraiche. Instinct tells me this will turn out really well in a large cast iron skillet. Should go beautifully with the crusty artisan loaf I baked yesterday. Roni, dying to hear what you think. Please come back and tell us how it went and give it a rating! Made this as written with a whole cut-up chicken, except had to sub a combo of half & half and butter for the heavy cream (a trick I usually do). It was so very French, and very rich. i can see why they eat small portions! Loved it! Lovely, Roni! Thanks so much for taking the time to let us know! I made this last night for our “Sunday Supper” church group. I was rushed after service to get the ingredients with limited time to get dinner on by 6. Living in a rural area running to the market for last minute items is a negative ghost rider. I get home with all my booty, set everything up to embark on my culinary adventure… re-read the recipe one last time… bacon? Oh no.. What? Rummage through inside freezer..no BACON…run to outside freezer in a panic, please baby Jesus let there be a lone package of bacon in here…my fervent search waz to no avail. Oh crap… so whip out the cherished can of bacon grease and sauteed the onions…okay, yes I’m blonde, what other excuse could I have for forgetting BACON? Never the less this dish was a HUGE hit with all 10 people. YES, I must admit, I didn’t share my mistake. I am eagerly awaiting a muligain needless to say. Yes! Soooo glad you trusted your instincts and didn’t panic, Bbqgoddess. Love that. I bet you do that with the rest of life, too! This is my favorite chicken recipe of all! It’s so good and smells heavenly. And, when I’ve had it for company, I’ve been able to do most of it ahead of time and then do the sauce just before dinner. Since, I can get distracted when we have guests, I do better when a recipe can be cooked ahead at least a little. Now, I am contemplating doing it for a larger get together and the prospect of 2 skillets is daunting. Has anyone tried putting the chicken in a large roasting pan after browning and then making the sauce in the skillet and pouring over the chicken to finish in the oven? Carol, that is exactly what I did this week and it came out perfectly. Thanks, David! That gives me the courage to go for it! 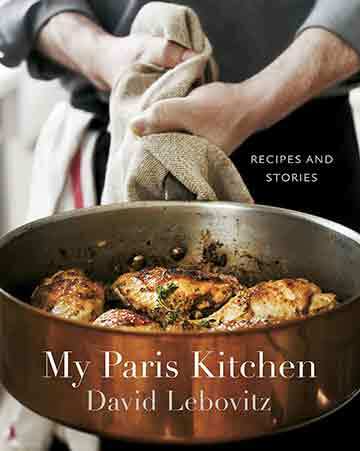 I recently purchased David’s book My Paris Kitchen and the first recipe I want to try is definitely the mustard chicken. After reading comments in David’s book about the proper mustard, my interest was peeked in Kristel Poole’s comment in her review that she uses a crock mustard she originally purchased in Paris that is available now in the US. I want my dish to be as good as it can be and am wondering if you have any recommendation for a top-of-the-line brand of mustard that is available in the U.S. Sure appreciate your feedback. I am also wondering what brand of mustard other cooks used. Thank you so much for your time. Linda, I’ve made this with mustards haute and not, and it always turns out well. Here is a list of the world’s best mustards. I’m sure you’ll find something that piques your interest. There’s really no way that you can go wrong with chicken, mustard and cream. I’ve made this dish according to the exact recipe, and I made it without measuring a single ingredient. Tonight we’re finishing the leftovers. I diced up the remaining chicken, added a little stock, more mustard and cream in order to make more sauce. Just make it with the ingredients you have on hand. I used chicken breast on the bone, cut in half. Pancetta instead of bacon. Sage instead of thyme. Don’t forget to make it again in about a month! You have to love a recipe that is so flexible. Thanks for letting us know, Linda.